The wrist roll is very important, since you will repeatedly perform it at the end of each section for the whole of Siu Lim Tao, and indeed the other forms too. 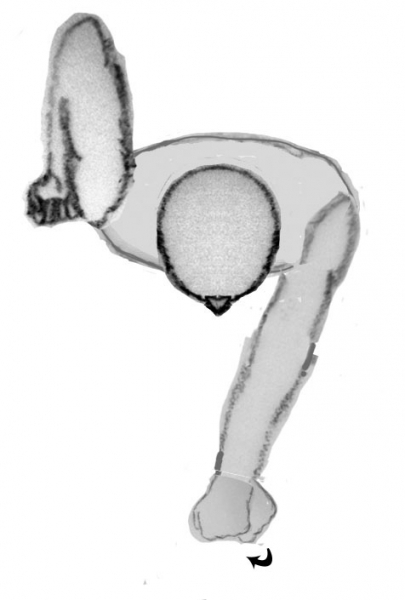 It is fundamental to strengthening the wrist, for building suppleness, and for the various motor skills necessary for executing techniques that involve the wrist. The Ancestors who designed the form knew what they were doing when they put it in every single section. This is a reflection of how important it is. It is, therefore, worth doing correctly from the very beginning to get maximum use out of the form, and your training. To neglect it is a reflection of the opposite. Although many schools call this “huen sau”, I call it “the wrist roll” to differentiate it from the technique called huen sau. 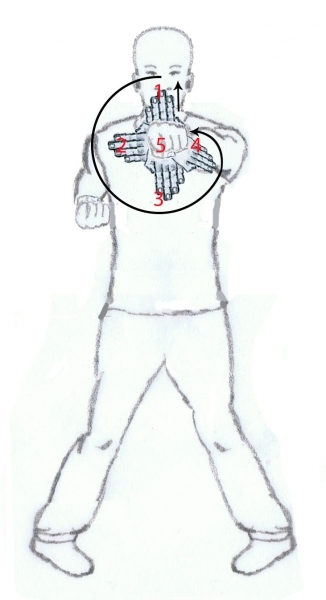 Huen sau simply means circling hand, and indeed describes this move, as well as the combat technique. The exercise is for strengthening, but the technique is for combat. They are trained differently, although usually have the same name. By calling this kind of huen sau a wrist roll, we can know the correct way we should do it. Huen sau the combat technique, moreover, needs the skills and strength built through doing the wrist roll correctly. However, the function and execution are sufficiently different from the wrist roll that I feel confusion often arises. So, in order to reduce the confusion, it is better to consider it by a separate term – one used for the move as an exercise, to differentiate it from the combat technique. The wrist roll must be done correctly at all times; the way to do it changing only slightly depending on the previous technique. The general procedure is the same. Given here is a general description for the one that ends every section, and will be the basic, beginner’s version. The slightly more advanced version will be dealt with later, after the articles on Siu Lim Tao are complete. 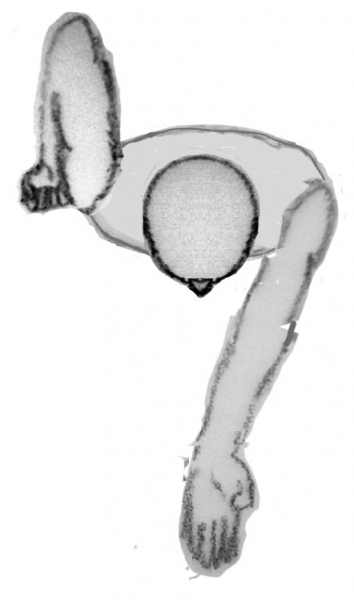 The wrist rolls at the end of the tan and fook sau movements are somewhat different, and will be dealt with separately at their section of SLT, and modified wrist rolls for other techniques will be discussed in their place in the forms. At the final move for each sequence, there will be a strike, and the arm is locked out and straight. Keep it straight. This is important. There are various objections people have at this point, but remember this is an exercise, and not a technique. 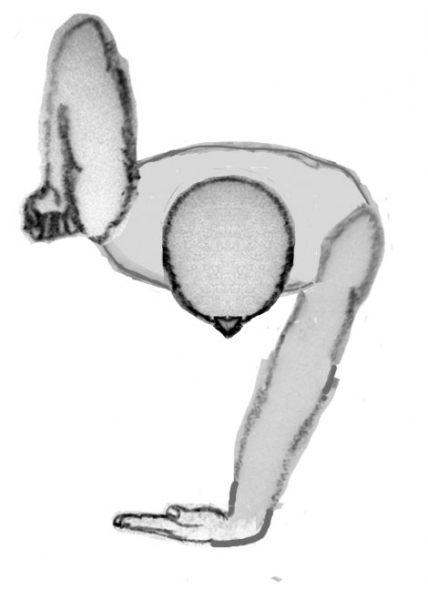 It is an exercise for strengthening the wrist for more than huen sau. Most importantly, over other things, it is the strengthening of the wrist for the punch. And no, someone can’t grab it and break the elbow because it is straight. It’s an exercise. It is from this position that the wrist roll will begin. Keep your elbow locked straight. Beginners are advised to put the hand out flat, with the palm facing up, at this point. 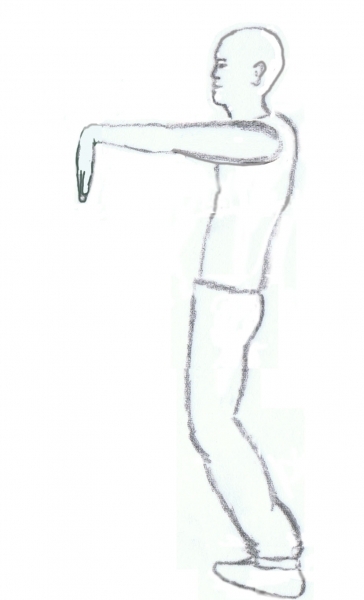 Later, this step will be removed, but the action will keep the student ‘honest’, in that the next move will, in fact, be vertical rather than in whatever direction the hand is pointing. It will also help to keep the wrist strongly bent. Keep tension on the wrist at all times, and the elbow locked straight. Roll by bending your wrist (not your fingers) as much as you can vertically upwards, bending only the wrist. Keep the fingers and palm as straight as possible. Ensure the direction is as vertical as possible by rotating your hand a little outwards. If you have problems, then this should be included as a stretch each time you do it until you can get the fingers pointing vertically. Now move through a full range of motion.While we are going through the move step by step at key points, the movement is in fact continuous and smooth, and quite slowly. Firmly bent, continuously and deliberately moved. It is done with effort, not a casual flick or a fast half circle. The elbow is locked straight throughout. 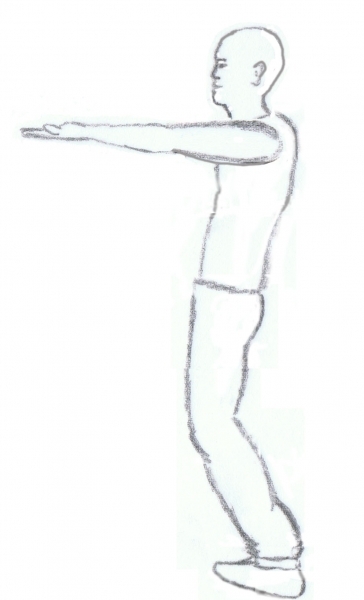 The body and stance are immobile, like a statue; The arm and shoulder are locked and wrist is on centre; there should be no up and down or in and out movements. Nothing moves except the wrist and hand. First, circle inwards until your fingers are pointing across your body to the opposite side. Keep the wrist bent to 90 degrees if possible with fingers and palms straight. See the gallery below for how it should look. Next, point the fingers downwards, grinding through the circle. Now, hand still open, and horizontal, bend outwards so the fingers are aiming outwards until the circle is almost finished. At the end of the circle the fist is semi-clenched, palm horizontal to the floor, and pointing outwards. Now we straighten the hand so the fist is in the centre, more or less like a northern fist. (Like a karate fist). The wrist roll is now complete. You can only go in one direction once you have rolled it upwards, which is inwards to the centre. You can’t roll outwards, it’s physically impossible. Roll it slowly and firmly, without moving the arm at all if possible. Keep the elbow locked straight. This also strengthens the elbow, the ligaments and tendons around it as well as the muscles, so that attacks to the elbow can also be resisted. The circle must be up, to centre, down, out, then make a fist. The wrist roll must be done under power, fully cranked throughout the entire circle, and done slowly. You should be able to feel the movement, with the point of maximum pressure moving from one side of the wrist right around to the other, missing no points, so the whole wrist is made strong. A strong wrist is needed to handle impact, attacks such as chin-na or aikido, and hitting incorrectly is less likely to strain or incapacitate your wrist, which is disastrous in a fight. From whatever technique you have just finished the hand should be on centre, with the elbow locked straight, from the strike just completed previously. In this case, it is the punch, but throughout the form, each strike is followed by this exercise. Wrist, elbow, and fingers should be straight and together, with the thumb in. First make a flat upwards facing palm, as shown in the above pictures. Keep the elbow locked. Stop for a moment to ensure that you are in fact putting the palm completely vertical and that the elbow is locked straight. Now, bend your wrist bend your wrist towards you as far as you can. Try to bend at the wrist, not the fingers. It is hard to do. The tension is all in the wrist. Vertically should be as far as you can turn the hand outwards anyway. If you can, you should start from maximum turned outwards. Then, keeping the elbow straight and the wrist as bent as possible, start to circle from vertical to the inside, rotating inwards until the hand is horizontal. Keep the pressure on the wrist, and keep it in centre, with the elbow locked. Continue turning downwards, bending at the wrist until pointing down. The wrist stays bent and on centre, and the elbow stays locked. At the maximum point downwards, the two bones of the forearm are level and flat, rather than one higher than the other. They now stay that way. Keep the two bones level. Now, rotate the hand outwards but do not rotate the arm. Just the hand, to put strain on the outside of the wrist. Keep the wrist on centre, keep the elbow locked. Do not rotate the shoulder while doing this. You should have felt the tension moving around the wrist from outside to inside, especially if you kept the movement strong. 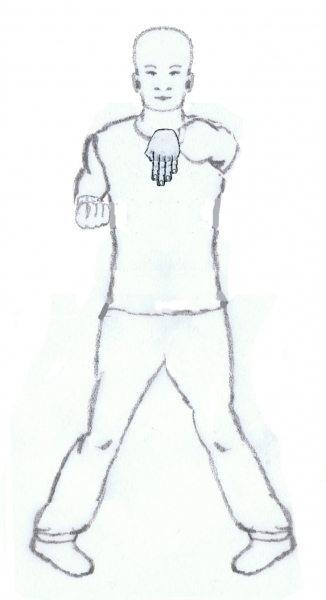 Keep rotating outwards until the hand is back to horizontal, but turn it into a horizontal fist, with the pressure still outwards, so that the wrist is bent outwards a little. 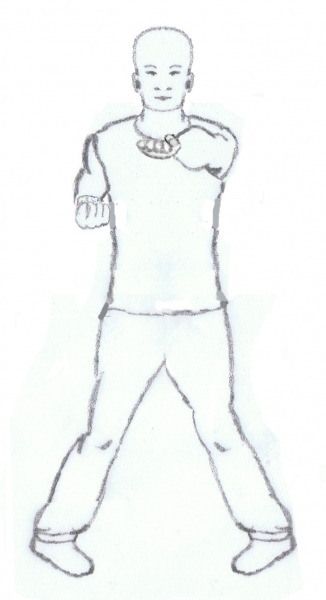 Now straighten the wrist and clench the fist into horizontal fist, the classical karate shaped fist. Now the wrist has moved through entire circle. The elbow is still locked straight. The wrist is still on centre. Stop for a moment to ensure the technique is clean and complete. Check posture and stance. The elbow should have remained completely locked straight the whole time. The last picture shows a summary. The movement is done smoothly and firmly, but not quickly, putting a lot of strain on the wrist over a period of time in order to strengthen it. This is simply a wrist exercise, not a technique, so doing it fast is counterproductive. It should never be flicky. After the wrist roll, there is always the elbow withdrawal. This has been described elsewhere, but I will describe it here again. From the previous position, the elbow is drawn back hard, ballistically. 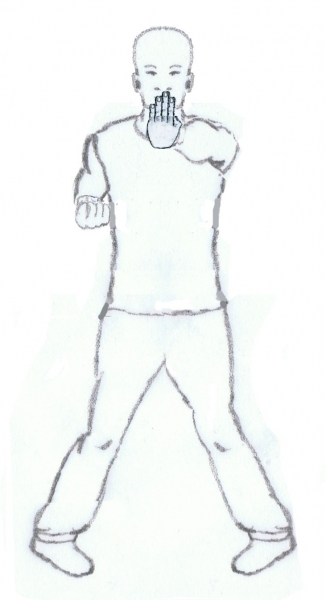 Do it like an elbow strike, hard and fast and strong. It should stretch the shoulder muscles. First, relax the hand a little from the previous technique, then turn the elbow down while the arm is still straight. Now, snap the elbow in a straight line, along the body, with the elbow kept in close, scraping the ribs, making as straight a line as possible between where it started and the enemy who is behind you. Ensure that the elbow ends up directly behind the body, not sticking out sideways at all, or it won’t work. Simultaneously, clench the fist at ‘impact’, just before you reach the maximum stretch behind you. 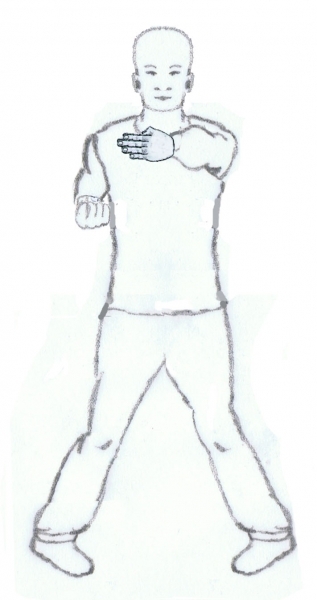 The fist ends up high in the armpit, fists are clenched, and the forearms are parallel to the floor and to each other. This is a powerful move, so put effort into it. You have now returned to the neutral training stance, ready to start the next section. Keep fist clenched when in this position. Stop for a moment before proceeding, take time to reaffirm stance, posture. Check to see if your toes are turned in, your waist is forward, and your position is correct before starting the next move. Next, you will repeat the punch, wrist roll and elbow withdrawal with the right hand. That will be the end of the introductory part of Siu Lim tao. After doing the punch, roll and elbow with the right hand, you will start what is known as the First section of Siu Lim Tao, also called “the first third” or by students who find it hard “the slow part”. It is sometimes known as “Praying Three Times to Buddha” due to the 3 wu sau techniques used on each side. However, before we start with the next section, we will consider some common errors, some important points, and further investigate the training stance of VTK.